These pages feature some of the many mountains, hills, fells, summits and high points in Britain. The criteria for inclusion are that (1) I've climbed the hill in question, and (2) that I've taken a photo at the summit. Wherever possible there is also a picture of the hill from a neighbouring summit or adjacent valley, or a picture of the view from the top. Britain is a small country yet it has a surprising diversity of landscapes and a considerable expanse of upland areas. We've got mountains, hills, fells, escarpments, heaths, moors and downs. We've got grassy summits, rocky summits, forested summits and even suburban summits. We've got odd, isolated hills rising from flat plains, we've got ranges of mountains, we've got clusters of fells, we've got huge upland plateaux of both mountain and moor. During the last 150 years or so the recreational use of our high ground has taken hold. People love to ramble, to hike, to hillwalk and to climb. It was perhaps inevitable that some of the explorers would turn to listing and classifying the hills that they'd climbed or aspired to climb. Thus there are many lists of British hills, each of them defined by a variety of criteria. Scottish mountains over 3000 ft high? There's a list. English hills exceeding 2000 ft? There's a list, in fact more than one. All UK hills with a relative height of 500ft or more? Yes, there's a list. Every list is different, and some are controversial. Disputes arise over just how you define your criteria. What makes a hill a hill, what makes a mountain a mountain? What, in essence, is the difference? If a hill has more than one top, how do you define which are principal summits and which are mere outliers? When does a mountain with several summits stop being a mountain and start being a mountain range? The problem is, of course, that all these things are subjective. Everyone has different opinions. In an attempt to satisfy these differences there are a variety of overlapping lists with different inclusion criteria for height, reascent, relative height, proportional height and distance. I recently found a quote on the web (and I regret that I've lost the reference), which says, "ultimately you can't define mountains by numbers." It's absolutely true. Every list, inevitably, contains summits that simply aren't interesting, and leaves out many that are. But that doesn't deter the "baggers" and list-tickers. We know that these lists are artificial, yet they represent a ready-made challenge which many cannot resist. There are those who dedicate themselves to climbing all the Munros, or all the Corbetts, or all the Wainwrights or Marilyns or whaterer else takes their fancy. I'll never complete any of the lists. (Well, perhaps the Wainwrights if I'm lucky). I'm a fair weather walker, I don't like exposure to steep drops, and I don't drive so many hills are beyond my reach. But I do love hills and mountains and summits, and I visit those I can whenever the opportunity arises. In these pages I want to share some of them with you. Below are some notes on the various lists. Mountains in the Scottish Highlands over 3000 ft, as listed by Sir Hugh Munro late in the 19th century. The feat of completing the Munros is still the ultimate achievement for hillwalkers and summit baggers. 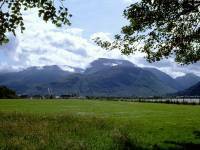 Munro divided his list into two sections - principal summits, and outlying "tops". However he defined neither, and many feel that he left glaring anomalies and inconsistencies. Tops to which Wainwright would have given a whole chapter languish in obscurity, having been defined neither as a Munro or a Top. Cairn Gorm, for instance, has thirteen recognisable summits; Munro defined Cairngorm itself as the principal summit but only 5 of the other 12 are Tops. Liathach, which most people think of as a single mountain, was regarded by Munro as a range and given two principal summits. Neighbouring Beinn Eighe, however, which has a more extensive and complex ridge than Liathach, got only one Munro - Ruadh Stac Mor, which topographically is an outlier some way off the main ridge. Re-surveying by the OS over the years has resulted in a number of summits either being promoted to or demoted from the list. Beinn Teallach in the Monadhliath range seems to have changed lists more than once. More contentious are the changes in status which the Scottish Mountaineering Club have introduced over the years - Tops have become Munros, Munros have become Tops, undefined summits have also come and gone. The SMC take a committee, and therefore consensus, approach to these changes, but they still remain subjective and some of them still appear to be inconsistent to outside observers. It's a debate that may continue indefinitely. There are currently 283 Munros and a further 227 Tops. All Munros are also Murdos (see below). Some writers refer to the Furth Munros - these are other British mountains that would qualify as Munros if the definition were extended to cover the whole country rather than just the Scottish Highlands. There are four Furth Munros in England and fifteen in Wales. A subset, Metric Munros (Metros) has been proposed, which would include all Munros over 1000 metres in altitude. "The word Munro has become synonymous with Scottish mountains over 3000 feet, yet anyone who has climbed all the Munros will be aware that numerous 3000-foot summits are not counted. The list of Munro Tops might therefore be regarded as a natural progression, but few Munroists have gone on to climb all of these. [Some believe that] the Munro Tops are an unsatisfying assortment of major mountain summits and minor bumps... The list of Murdos provides a much more rational and appealing extension to the Munros. "A Murdo is a Scottish peak over 914.4 metres high (3000 feet) with a reascent of at least 30 metres (98 feet). The 444 Murdos comprise all 277 Munros, 160 of the most significant Munro Tops and seven additional summits. The list of Murdos [includes] the most rewarding 3000-foot summits without the less significant tops." Alan Dawson has also appended a list of sub-Murdos, which are summits that just fail to qualify for inclusion in the list (useful, as resurveys may promote at least some of them to full Murdohood some day). One writer has had the idea of extending the definition of Murdos throughout the British Isles. In this scenario, in addition to the 444 Murdos in Scotland there are also 6 in England, 15 in Wales and 13 in Ireland. John Rooke Corbett's list encompasses all of Scotland, not just the Highlands. He listed summits that are above 2500 ft in height and are not already Munros; furthermore, he stipulates a minimum 500 ft reascent. This extra rule excludes less significant tops and gives his hills a degree of distinction. Effectively the Corbetts are a "second division" of peaks in the Highlands. Resurveys occasionally promote and delete hills to and from this list; there are currently 221 Corbetts. Rather more recently a list of Corbett Tops has been produced, and also one of Corbett Tops of Munros. Corbett Tops have a 100 ft reascent criterion, the same as Murdos. Some walkers also refer to English and Welsh 2500-ers as Furth Corbetts or Welsh / English Corbetts. All Corbetts are also Marilyns (see below), save for one specific exception involving two adjacent Corbetts with identical heights. Donalds (after the compiler, Percy Donald) are Scottish hills outwith the Highlands, with a minimum height of 2000 ft. His list is subjective in that it stipulates no reascent figure, but in practice all Donalds have a reascent of at least 100 ft and there are no apparent omissions or anomalies. The original list covered the Southern Uplands but a small number of hills close to (but outside) the Highland Boundary Fault have recently been appended. There are 87 Donalds. Some hills are both Donalds and Corbetts. Basically, all Scottish hills between 2000 and 2500 ft. A "Third Division" if you like, though this category includes some significant and popular mountains such as Suilven and Stac Polly. Like the Corbetts, a reascent of at least 500 ft is stipulated. This list of hills was first published in The Relative Hills of Britain (Alan Dawson, Cicerone Press, 1992). Originally, Scottish hills in this height range were referred to as Elsies (short for Lesser Corbetts). They have since been renamed Grahams in memory of the late Fiona Torbet (née Graham), who compiled her own list of such hills at around the same time. Her initial list omitted all hills in Southern Scotland and about a dozen in the Highlands, but included several hills with less than 150 metres of reascent. To avoid having two conflicting lists, it was agreed to use the existing list published in The Relative Hills... (with a few name changes), but to refer to the hills as Grahams. There are 224 Grahams. Some hills are both Donalds and Grahams; all Grahams are also Marilyns (see below). There is also a list of Graham Tops (of Munros, Corbetts and Grahams); these , like the Corbett Tops, have a reascent of 100 ft. The Marilyns are another invention of writer and walker Alan Dawson and represent an attempt to rationalise the differences in criteria between the various lists covering Britain, Scotland, Ireland, Wales, England-and-Wales or the British Isles as a whole. However, it introduces a quirk of its own - it stipulates a *relative* height of 500 ft from all surrounding terrain. The Marilyns cover all Britain but exclude Ireland. Very recently the 500 ft criterion appears to have been "metricated" to 150 metres, but this has made no actual difference to the list itself. This 500 ft (or 150m) relative height stipulation brings in hill summits in relatively minor English hill ranges such as the Cotswolds and Lincolnshire Wolds, some of which might be regarded as obscure, boring or remote – but of course the same can be said of certain Munros. The higher Scottish Marilyns are also Munros or Corbetts (or Murdos); those between 2000 and 2400 ft high are the same as the Grahams (see above). A major advantage of Marilyn bagging is that it encourages you to explore parts of Britain that other lists don't cover, but a downside is that it brings in tops on several remote Scottish islands (such as St Kilda), plus a small handful of fearsome sea stacks that require advanced climbing skills. Some Marilyns are barred from public access and it seems doubtful whether anyone will ever succeed in climbing all of them. There are 1554 Marilyns at present though the number fluctuates occasionally as maps are republished with newly surveyed contours, or independent surveys accepted by the OS establish more accurate heights. A list of sub-Marilyns (those that don't quite make it either on the height or reascent criteria) has also been compiled. The 214 Lakeland summits listed in Alfred Wainwright's seven volumes have never officially been given the collective description of "The Wainwrights" but the definition seem to have come into popular usage almost by default. Wainwright stipulated a specific, tightly-bound area within which he listed and surveyed every summit above 1000ft, though there was no reascent or distance criterion, several blatant omissions (e.g. Walna Scar, over 2000ft high, south of Coniston Old Man) and a sentimental inclusion or two (e.g Castle Crag in Borrowdale). As well as being subjective his list was also inconsistent. For instance, he gives Scafell Pike two Tops (Broad Crag and Ill Crag), yet Skiddaw Low Man is listed as a separate fell. Few would regard Armboth Fell as a separate hill, particularly as half a dozen similar bumps attached to neighbouring Ullscarf were given no such distinction. Several other Wainwrights, such as Pavey Ark, are not even summits but merely appear to be so when viewed from below. And as for Mungrisedale Common.... it seems likely that AW was just filling space in Book 5. Having said all that, the Wainwrights remain as the finest list of Lakeland hills bar none. Another invention of Alan Dawson, and introduced and listed by him in The Relative Hills of Britain. An acronym - Hills in England, Wales or Ireland over Two Thousand feet high. There is a reascent criterion of 30 meters (100 ft approx). Previously the Hewitts were known as the "Sweats" and excluded Ireland. There are 525 Hewitts in total: 178 in England, 138 in Wales and 212 in Ireland. Apart from the 211 Irish Hewitts many hills in this list are also Marylins and may also be Wainwrights. All Hewitts are also Nuttalls (see below). John and Anne Nuttall have published a two-volume book, Mountains of England and Wales (Vol 1: Wales, Vol 2: England). These books, and the Nuttalls website, list summits over 2000 feet (610m) with a reascent of 50 feet (fifteen metres). There are 443 Nuttalls. Michael Dewey's "Mountain Tables" is currently the most recent list to appear in print, a slightly quirky publication listing English / Welsh hills lower than 2000 ft but higher than 500 metres (roughly 1550ft), with a 100 ft reascent criterion - there are 186 in England, 242 in Wales and 5 on the Isle of Man. They are in effect a second division of Hewitts. Based on a list by Clem Clements, these are hills in England, Wales and the Isle of Man of 100 ft prominence and between 1000 ft and 500 metres in height; the division below Deweys, in effect. There are an estimated 1712 Clements. Based on a list compiled by Rob Woodall of the Relative Hills of Britain Yahoo group, these are the Scottish equivalent of the Deweys; i.e. hills higher than 500 metres with 100ft prominence not already on other lists. There are 1015 of them. I have been calling them the Woodalls on these pages in the past. In 1989 Dr Eric Yeaman published a bumper list of Scottish mountains, including all those with a reascent of 100 ft plus others qualifying by a measure of distance. Purely for the purposes of these pages, however, I'm counting a hill as a Yeaman only if it's between 1000ft and 500 metres in height, i.e. it's not already listed as a Munro, Corbett (or Corbett Top), Graham (or Graham Top) or Woodall. In effect my Yeamans list is the Scottish equivalent of the Clements. There are 2326 of them. HuMPs are a superset of Marilyns; the acronym means "Hundred Metre Prominences". Thus the HuMPs are all British hills with a hundred metre (roughly 330 ft) prominence regardless of height. They encompass the Marilyns, sub-Marilyns and others. The HuMPs serve two purposes; they give seasoned Marilyn baggers yet more hills to tick, and they also introduce a purely metric British hill list for the first time. There are currently 2985 HuMPs, of which just 820 lay outside Scotland. One practical difficulty facing any aspiring HuMP bagger is that a good many of the lesser ones have no public access whatsoever, often being situated on working farmland. Another is that the HuMPs include a summit that is arguably the most difficult in Britain - the Old Man of Hoy, a fearsome sea-stack in the Orkneys. A definitive list of HuMPs has been compiled by Mark Jackson. ThuMPs are purely my own invention; the list contains nothing new but is simply a collection of all lists of hills of 100ft (i.e. 30 metre) prominence. I wanted a list that would start with the Murdos (in Scotland) and the Hewitts (in England) but would extend down to 1000ft of altitude. Thus it is a combination of the Murdos, Corbetts and tops, Grahams and tops, Hewitts, Deweys, Donald Deweys, Clements and Yeamans. It doesn't include any hills less than 1000ft high. Many other lists have been published, many of them relatively recently, and it's worth mentioning them here. John Rooke Corbett, as well as his list of Scottish 2500 ft summits, also drew up a list of English 2500 ft summits in 1911. It was published in the Rucksack Journal. It was revised in the 1920's and later amended by Edward Moss in 1933. In the same year W T Elmslie published a list of English 2000 ft hills. F H Simpson followed up in 1937 with a list of Lake District 2000 ft summits, using more accurate mapping. Edward Moss extended Simpson's list with one covering the whole of England in 1939 and then Wales in 1940. He subsequently published a number of updates. George Bridge was next on the scene, his 1973 list covering 2000 ft summits in England and Wales using a criterion based on a relative-height-plus-distance formula. Another list of English summits, compiled by Nick Wright, appeared in 1974. Chris Buxton and Gwyn Lewis published a more comprehensive English / Welsh 2000 ft summit list in 1986, with a reascent criterion of just 10 metres - consequently this list includes a great many minor tops. Finally, Richard Moss, the son of Edward Moss, maintains an internet database of English / Welsh hills based on his father's tables. It cross references these with the lists of Dawson (i.e. Hewitts), Nuttall, Bridge, Buxton & Lewis, and Wright. A way to visualise relative height is to imagine that sea level can rise and fall. To determine the relative height of any given hill, imagine that the sea rises just enough to cut your hill off completely from all higher ground. The relative height is your hill's elevation above the new, imaginary, sea level. Summit lists that rely on the concept of relative height, such as the Marylins, therefore list hills of individuality - those that stand out from their neighbours. A consequence of such a list is that it always includes the principal summit of any upland area but will tend to leave out the minor tops or "bumps". Upland plateaux such as Dartmoor tend to have few summits with a significant prominence, whereas "peaky" areas such as Kintail will have plenty. Ultimately, though, even lists based on relative height are going to have boring summits as well as exciting ones. The concept of aesthetic appeal just can't be based on numbers.